Anonymous Hackers message to LunarPages for removing personal page of Libyan dictator Colonel Muammar al-Gadaffi ! personal page of Libyan dictator Colonel Muammar al-Gadaffi ! This is Anonymous. We're here to inform you that you are hosting the personal homepage of Libyan dictator Colonel Muammar al-Gadaffi. We, and the rest of the internet, find this behaviour unacceptable especially in light of the current genocide being waged on the people of Libya. We therefore request that you cease doing business with him. We ask you kindly to remove algathafi.org from the internet. We wish you no harm, but we do not believe that it is good neither for you nor anyone else that algathafi.org remains available. By inadvertently supporting him your business sends a message of disregard for human lives and this may affect you financially. This is not a threat just a gentle nudge for you to do what is right for the Libyan people. Although you are not in Libya to support the population by fighting physically, there is still something you can do. The Libyan people are fighting on the streets for their freedom and survival. The rest of the world is fighting here, on the internet. Be a part of the revolution, take down algathafi.org. As you must be aware, Anonymous deplores injustice in all its forms, and particularly such heinous acts as genocide. 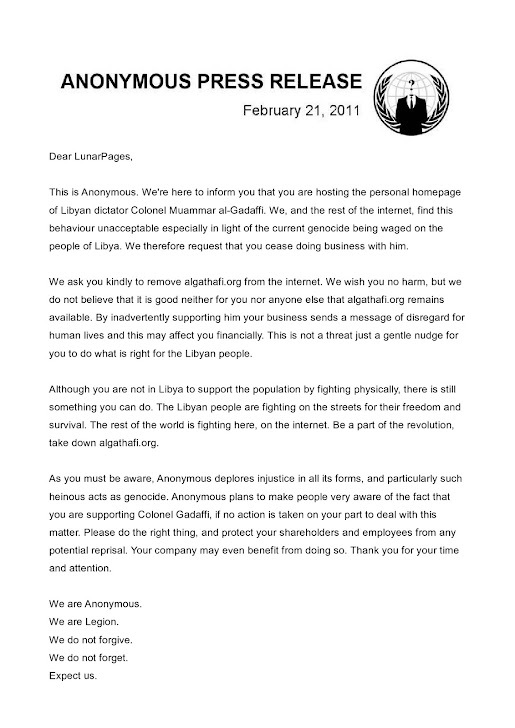 Anonymous plans to make people very aware of the fact that you are supporting Colonel Gadaffi, if no action is taken on your part to deal with this matter. Please do the right thing, and protect your shareholders and employees from any potential reprisal. Your company may even benefit from doing so. Thank you for your time and attention.